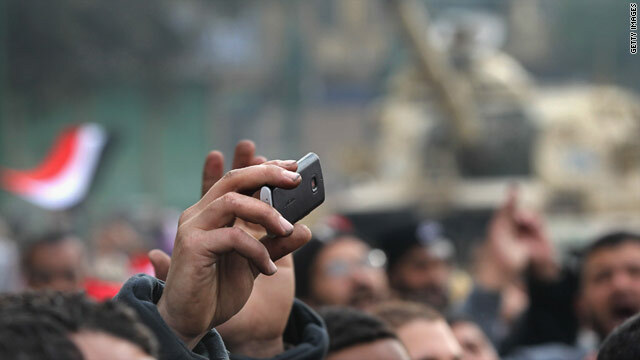 Online social networks and other digital tools are often credited with helping Egyptian protestors topple the government. (CNN) -- This has been the year of social media crackdowns. First there was Egypt, where the government shut down the Internet in January amid protests that toppled the 30-year rule of president Hosni Mubarak. Then it was Libya, where something similar happened. And, most recently, UK Prime Minister David Cameron said he was considering shutting down digital-communication channels during riots that had gripped the country. As CNN's Mark Milian reports, the UK has since backed down from that claim, but the discussion caused much controversy online. Behind all of these happenings is a theory: That new-ish communications technologies -- from Facebook and Twitter to BlackBerry Messenger -- help people mobilize and revolt against governments. Tech insiders tend to see the Internet and social media as democratizing forces -- digital tools that can be used to topple dictators and spark change. "If you want to liberate a society, just give them the Internet." That's essentially the argument of Navid Hassanpour, a political science graduate student at Yale, who writes in a recent and widely-talked-about paper that social media actually hurts a particular group's chance of organizing a meaningful and successful revolution. "Social media can act against grass roots mobilization," he writes. "They discourage face-to-face communication and mass presence in the streets. Similar to more traditional and highly visible media, they create greater awareness of risks involved in protests, which in turn can discourage people from taking part in demonstrations." He uses mathematical models to map out why this was the case in Egypt. To put this in a pop-culture context, think about Facebook photos of your friends. To some degree, seeing what they're up to all the time could stop you from actually meeting up with them in person to communicate. And that face-to-face interaction is key to political mobilization, Hassanpour says. Here's how the New York Times explains it: "All the Twitter posting, texting and Facebook wall-posting is great for organizing and spreading a message of protest, but it can also spread a message of caution, delay, confusion or, I don't have time for all this politics, did you see what Lady Gaga is wearing?" In the absence of all this digital buzz, he says, people organize. "We become more normal when we actually know what is going on -- we are more unpredictable when we don't -- on a mass scale that has interesting implications," Hassanpour told the Times in an interview. Hassanpour isn't the first to argue against the conventional wisdom that social media helps spark revolution. Evgeny Morozov, a visiting scholar at Stanford University and author of the recent book "The Net Delusion: The Dark Side of Internet Freedom," says dictators use digital communications to track and crack down on dissenters. "People who are concerned about freedom and democracy and creating democratic values abroad -- those of us in the West who are concerned about that -- we are probably far better off assuming the worst," he told CNN in February. "We are far better off assuming the Internet will strengthen dictators."